What is the most critical thing swings your decision when you choose a programming language? OK. It may be true. But writing less code is not a quantitative indicator which results in the same outcome whenever, wherever. Depending on the task you are focusing on, lines of code floats up and down as well. I think a better way is to inspect what primitives the programming language have. For some old-school programming languages, they may not have multi-dimensional array. This leads an array cannot hold another one in itself and disallows developers to invent some recursive data structures and limits the expressiveness of the language. The expressiveness of a programming language, formally, is the computational capability of a programming language. But the array example I mentioned above is just about runtime computational capability. What about the compile-time's? Well. Languages like C++ which has an explicit compile progress and some "code template" infrastructures hold an ability to do some compile-time computations, which collects the pieces of the source code and then organize them into a piece of new code. You may have heard a buzz word: "meta-programming". Yes, this just is meta-programming (but at compile-time) and there is a bunch of programming languages includes C and Swift can do compile-time meta-programming. Meta-programming in C++ relies on templates. In C, it relies on a special header called metamacros.h in libobjcext. In Swift, it relies on generics. Though you can do compile-time meta-programming in these three programming languages, the capability of them are different. Since there are a lot of posts talked about the reason why C++ template is turing complete (a measurement of computational capability, you can just briefly treat it as "can compute anything"), I don't want to waste my time on it. I'm gonna talk about generic meta-programming in Swift and give a brief introduction of metamacros.h in C. These two programming languages are weaker than C++ in compile-time meta-programming. They are only able to implement a DFA (deterministic-finite automaton, another measurement of computational capacity. You can briefly treat it as "can compute things with finite patterns") capped compile-time computational infrastructure. There are a lot of Auto Layout helper libraries: Cartography, Mansory, SnapKit... But, are they really good? What if there were a Swift versioned VFL which ensures the correctness at compile-time and can collaborate with Xcode's code completion? Truth be told, I'm a fan of VFL. 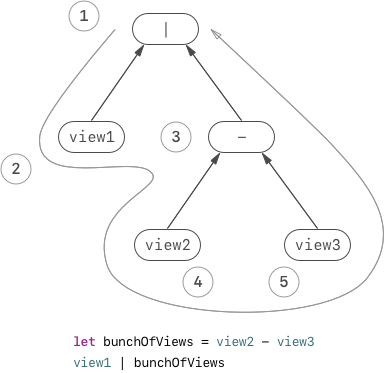 You can lay many views out by using one line of code. With Cartography or SnapKit, things always go tedious. Since the original VFL has some issues with modern iOS design, which cannot cooperate with layout guides, you may also want layout guide support in the API suite we are gonna implement. Finally, in my production code, I built the following API which is compile-time-ensured safe and supports layout guide. Just imagine that how many lines of code you need for building equivalent things with Cartography or SnapKit? Have already been wanted to know how I built it? // Original VFL: @"[view1([email protected])]"
// Original VFL: @"V:|[view1]-(>[email protected])-[view2]|"
An intuitive answer is to use operator overload. Yes. I've done this with operator overload in my production code. But how does the operator overloading work here? I mean, why the operator overloading is able to convey our design? Before answering the question above, let's check some examples out. We can find that there is missing another view object or a -| after 4. We want our system to be able to handle correct input by making the compiler to accept it and to be able to handle incorrect input by making the compiler to reject it (because this is what compile-time-ensured safe implies). The secrete behind it is not some black magic which applied by an mystic engineer whom have got a "Senior SDE" title, but simply to accept by matching user input with a defined function and to reject by all defined functions mismatching the user input. // Do something really combine these two views together. If we take the UIView and BinarySyntax in the above code block as two states, then we introduced state transitions into our system, and the approach of state transitioning is operator overloading. Knowing that by introducing state transitioning with operator overload may solve our problem, we may feel at a bit ease now. But... How many types we are gonna create with this solution? What you may not know is that, VFL is expressible by a DFA. Yes. Since recursive texts like [, ], ( and ) are not really recursive in VFL (only one level of them can appear in a correct VFL input and cannot be nested), a DFA is able to express the complete possible input set of VFL. Thus I created a DFA to simulate the state transitions of our design. Watch out! I didn't take layout guide into consideration in this figure. Introducing layout guide may make the DFA much more complicated. In the diagram above, |pre means prefix | operator and respectively |post means postfix | operator, double circle means an accepting state and single circle means a receiving state. A binary operator consumes two transitions but an unary operator consumes one. Each operator creates a new type. I drew the DFA diagram above by deadly putting possible characters to test whether a state receives them or not, this maps all the things into one dimension. May be we can create a cleaner expression by abstract the problem in multiple dimensions. Before the beginning of further exploration, we have to acquire some basic knowledge about Swift operator's associativity. The associativity of an operator (strictly speaking, of a binary operator, which mean an operator connects a left-hand-side operand and right-hand-side operand, just like -) is for which side of an operator, a compiler may prefer to use it for constructing syntax tree. The default associativity of Swift operator is left, which means the compiler prefer to use the left-hand-side of an operator to construct a syntax tree. Thus we can know for a syntax tree of a left associative operator, it is visually left-leaning. Binary syntaxes like view1 - view2, view1 | view2. Unary syntaxes like |view1, view1-|. Soon it will be find that we can plug anything on the Lhs or Rhs of Binary, or the Operand of Unary. We have to do some limitations. Typically, inputs like |-, -|, |prefix, |postfix shall only be appeared the at head and tail two sides of the syntax. Since we also want to support layout guide (such as safeAreaLayoutGuide), which also should only be appeared at the head and tail two sides of the syntax, we have to constrain these stuffs are ensured only at the head and tail side of the syntax. Moreover, inputs like 4, >=40 shall only be appeared when paired with preceding and succeeding view/superview or layout guide. The above study of the syntax hinted us to split all things take participant in the syntax into three groups: layout'ed object (views), confinement (layout guides and things wrapped by |-, -|, |prefix and |postfix), and constant. Then for specific combinations of syntaxes like view1 - 4 - view2, we can make following syntax types. By conforming to the protocol Operand, a type indeed have got two compile-time storage whose names are HeadAttribute and TailAttribute, and values are of type of SyntaxAttribute. By calling the function - (anyone in the above code block), the compiler checks if the left-hand-side and right-hand-side matches any function with the name - by reading generic constraints of the result type (ConstantToLayoutableSpacedSyntax or LayoutableToConstantSpacedSyntax). If it succeeded, we could say the state has successfully transitioned to another. We can see that, since we've set HeadAttribute = Lhs.HeadAttribute and TailAttribute = Lhs.TailAttribute in the body of the types above, the head and tail attribute of Lhs and Rhs is transferred from Lhs and Rhs to the newly synthesized type now. The value is stored in the type HeadAttribute and TailAttribute. Then we've got our functions which make the compiler to receive input like view1 - 4 - view2, view1 - 10 - view2 - 19... Wait! view1 - 10 - view2 - 19??? view1 - 10 - view2 - 19 shall be an illegal input which may be rejected by the compiler! Actually, what we did above just have ensured that a view is consecutive to a number and a number is consecutive is a view, it has nothing to do with whether the syntax shall be beginning with a view (or layout guide) and end with a view (or layout guide). But this logic cannot be simply implemented with Swift in compile-time, and the only logic of Swift compile-time computation is the and logic. Since we can only use and logic in type constraints in Swift (by using the , symbol between Lhs.TailAttribute == SyntaxAttributeLayoutedObject and Rhs.HeadAttribute == SyntaxAttributeConstant in the example above), we can only merge the (lhs.tailAttribute == .isLayoutedObject || lhs.tailAttribute == .isConfinment) and (rhs.headAttribute == .isLayoutedObject || rhs.headAttribute == .isConfinment) in the above code block into one compile-time storage value then use the and logic to concatenate them. In fact, the == in Lhs.TailAttribute == SyntaxAttributeLayoutedObject or Rhs.HeadAttribute == SyntaxAttributeConstant is equivalent to the == operator in many programming languages. Moreover, there is a >= equivalent in Swift's compile-time computation which is :. Now the T in Foo ought to be "larger than or equal to" Two. This time, we added two new compile-time storage: HeadBoundary and TailBoundary, and their values are of type of SyntaxBoundary. For view or layout guide objects, they offer head and tail two boundaries of SyntaxBoundaryIsLayoutedObjectOrConfinment. When calling the - function, the a view or layout guide's boundary info transferred to the newly synthesized type. Then, only syntaxes whose boundaries are of layout guide or views can be accept. But the concept of syntax boundaries still cannot help stop the compiler from accepting inputs like view1-| | view2 or view2-| - view2. This is because that even the boundaries of a syntax is ensured, you cannot ensure the inner part of the syntax is associable. For syntax like |-, -| or layout guide in a syntax, we can just disable their associativity in new type's synthesize progress. Yes. Actually, I'm cheating here. You may wonder that why I can quickly spot issues by enumerating some examples and say yes to the question above without any hesitation. The reason of that is that I've already enumerated all the syntax tree constructions on paper. Planning on paper is a good habit for being a good software engineer. Now the core concept of the syntax tree's design is very close to my production code. You can check it out at here. OK. Come back. We still have something to be implemented, which is critical to our whole work -- generate layout constraints. Since the actual thing we get in the argument of withVFL(V:) function series is a syntax tree, we can simply build an environment to evaluate the syntax tree. I'm trying to keep myself away from using buzz word, thus I was saying that "build an environment". But I cannot stop myself from telling you that we are going to build a virtual machine now. By taking a look into a syntax tree, we can find that each level of the syntax tree is whether an unary operator node, a binary operator node or an operand node. We can abstract the computation of NSLayoutConstraint into small pieces and ask these three kinds of node to populate the small pieces. Sounds good. But how to do the abstraction? And how to design those small pieces? For people whom have experience on designing a virtual machine or compiler constructions, they may know this is a problem related to "procedure abstraction" and "instruction set design". But I don't want to scare readers like you whom may not have enough knowledge about virtual machine or compiler constructions, thus I call them "abstract the computation of NSLayoutConstraint" and "small pieces" above. One more reason of that I'm not talking with the term "procedure abstraction" and "instruction set design" is that "instruction set design" is the most frontend thing of the solution: you would get a thing call "opcode" (short for operation code. I don't know the reason why they shorten the term this way, but that's it.) later. But the "instruction set design" heavily affects the final form of "procedure abstraction" and you only can hardly derive the concept behind an instruction set without thinking about the "procedure abstraction" before doing "instruction set design". comes to be an unavailable option for us. You cannot get layout guide work with this API. Yes, I've tried. Then we may come up with layout anchors. Yes. This works. My production code makes use of layout anchors. But why layout anchors work? In fact, we can check the documentations and know that the base class of layout anchors NSLayoutAnchor has a group of API which generates NSLayoutConstraint instance. If we can get all the arguments of this group of API in deterministic steps, then we can abstract a formal model for this computation progress. Can we get all the arguments of this group of API in deterministic steps? The answer obviously is "yes". But even the root node is the first visited node in the whole evaluation process, since it requires the evaluation result of its left-hand-side child and right-hand-side child to complete the evaluation, it generates NSLayoutConstraint instance at the last. By observing the figure of Swift syntax tree evaluation process above, we can know that the node view1 was evaluated at the second but the evaluation result would be used at the last, thus we need a data structure to store each node's evaluation result. You probably would come up with stack. Yes, I'm using stack in my production code. But you shall know the reason why we need a stack: a stack transforms a recursive structure into linear, that is what we need. You may have already guessed that I'm gonna use stack, but intuition doesn't work all the time. With this stack, we have to put all the computational resource of initializing an NSLayoutConstraint instance in it. Moreover, we have to keep the stack to memorize the head and tail node of the syntax tree that have been evaluated. 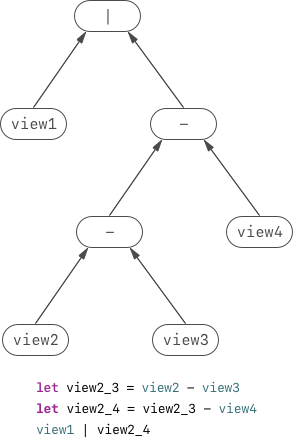 When we evaluating the node - at the second level of the tree (count from the root), we have to pick view3, which is the "inner" node of the tree, to make an NSLayoutConstraint instance. Actually, generating NSLayoutConstraint instances always needs to pick the "inner" nodes which with the perspective of the node being evaluated. But for the root | node, the "inner" node soon comes to be view1 and view2. Thus we have to make the stack to memorize the head and tail node of the syntax tree that have been evaluated. Yes, we have to design a mechanism to let each node of the syntax tree to return the evaluation result. I don't want to talk about how a real computer returns value over stack frames, because it varies over different size of the data to be returned. In Swift world, since all things all safe, which means the API that bounding a piece of memory to be another "type" is difficult to access, processing data with such a fragile rhythm is not a good choice (at least for coding efficiency). We just have to use a local variable in the evaluation context to keep the stack's last pop result, then generate instructions to fetch data from that variable, then we've done the design of the "return value" system. Once we completed the procedure abstraction, then the design of instruction set just needs the last push. Fetch views, layout guides, relations, constants and priorities. Generate the information about which anchor to pick. Pop and push the stack. We've done the whole concept of our compile-time-ensured safe VFL. The question now is what do we gain with it? The advantage we got here is that the correctness the syntax is guaranteed. Syntaxes like withVFL(H: 4 - view) or withVFL(H: view - |- 4 - view) would be rejected at compile time. Then, we've got layout guide worked with our Swift implementation of VFL. Third, since we're executing instructions which generated by the syntax trees organized at compile time, the total computation complexity is O(N), which N is the number of instructions a syntax generated. But since the syntax trees are not constructed as compile-time, we have to construct the syntax tree at runtime. The good news is that, in my production code, the syntax tree's type is of struct, which means the whole syntax tree is constructed on stack memory but not heap memory. In fact, after a whole day of optimizations, the performance of my production code exceeded all the implementation of existing alternative solutions (includes Cartography and SnapKit), which of course includes the original VFL. I would place some optimization tips at the end of this post. Theoretically, the original VFL has a bit more advantages on performance over our design. VFL strings would actually be stored as C strings in the executable file(Mach-O file)'s data segment, the operating system loads them into the memory directly and there are no initializations shall be done before using them. After loaded those VFL strings, the UI framework of the targeted platform is ready for parsing the VFL string. Since VFL's grammar is quite simple, building a parser works with time complexity of O(N) is also quite simple. But I don't know the reason why VFL is the slowest solution which helps developers to build Auto Layout constraints. The following result is measured by building 10k constraints on iPhone X. Array in Swift would spend a lot of time on checking whether its internal storage is implemented by Objective-C or Swift. Using ContiguousArray would make your code think Swift-ly in dedication. Collection.map in Swift is well optimized -- it reserves capacity before appending elements, which eliminates allocating overhead. But if you're mapping an array into a multi-dimensional array, and then flatten it into a lower dimensional array, reserve the capacity at the beginning and then using traditional Array's append(_:) function is a better choice. Don't use non-nominal types (tuples) with writing scenes. When writing non-nominal types, Swift needs to access the runtime to ensure the code safety. This cost a lot of time. You should use a nominal type, or say struct instead. subscript.modify is a kind of function used for modifying a member value of a container's element. But it seems did a lot more than modifying a value. I even don't know why there are malloc and free on my evaluation tree. I replaced the evaluation stack from Array to my implementation, and implemented a function named modifyTopLevel(with:) to modify the stack top. The convenience of OptionSet is not free in Swift. You can see that the OptionSet employs a very deep evaluation tree to get a value which can be evaluated by manually bit masking. I don't know if this phenomenon exists for release build, but I'm using manually bit masking in my production code now. Exclusivity enforcement also impacts on performance. You would see a lot of swift_beginAcces and swift_endAccess in your evaluation tree. If you are confident with your code, I suggest you to disable runtime exclusivity enforcement. Search "exclusivity" in your build setting you can find the option to turn it off. Exclusivity enforcement is enabled for release build in Swift 5. // Do what you wanna do with a normal atomic weak Objective-C getter. // Do what you wanna do with a normal atomic copy Objective-C getter. // Do what you wanna do with a normal nonatomic retain Objective-C getter. The implementation file is here. metamacros.h is very useful scaffold to help C programmer to create macros to ease brain burdens. Thank for your reading of this long post. I have to apologize. I lied in the title. This post is totally not a "glimpse" into Swift generic meta-programming, it talks about many deep content about computation. But I think this is a bunch of basic knowledge to be a good programmer. Finally, may the generics meta-programming in Swift don't come to be a part of contents of iOS engineer interview.